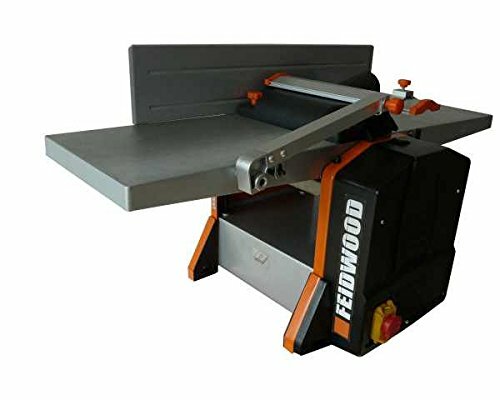 Plane DEGAUCHISSEUSE 260 mm 1500 WATTS FEIDWOOD-Twinpack Jointer F2550RD.an entry level of capacity, but very interesting with its 260 mm Width of dégauchissage.to redress, dégauchir MORTISING, and calibrate your bleach, or simply Wood Woodworking, it offers of the state of surface you can completely satisfaisants.MORTISING of wood pieces per is successively 3 mm maximum section up to 250 x 120 mmOther features: a machine, ideal for work in the studio and on Tables dégauchissage chantier. -Cast aluminium Length 915 mmSIDE Guide Jointer comfortable area (620 x 125 mm) and Tilts up to 45 degrees. -Adjustable thickness of Planing by manivelle. -training provided by two rolls coated with rubber will not leave any marks on the speed training wood.Planing 8 m/min.Hood MANIFOLD Chips well-dimensioned and really effective, Can be used both in dégauchissage in Planing for a healthy and atmosphere sécurisée.Switch circuit breaker to lack of voltage to avoid a restart after a "cut-off" supply. -Fitted with rubber feet (anti-vibration.